The Democrat-written, democrat-passed, democrat-manipulated and democrat-postponed Obamacare law was been a mess from the start, and it isn’t over yet, not by a long shot. The Obama administration has democrats deeply worried, because they are facing midterm elections, and the health care law that was supposed to create a grateful electorate that would vote overwhelmingly for them, is in a shambles. As well as trying to repeal it outright, Republicans have tried to postpone parts of the law more than once. Each time they have been rebuffed by democrats and president Obama. For their part, President Obama and the democrats have successfully moved the Obamacare goalposts many times. Each time it has been to avert a disaster – mostly an electoral disaster for themselves. 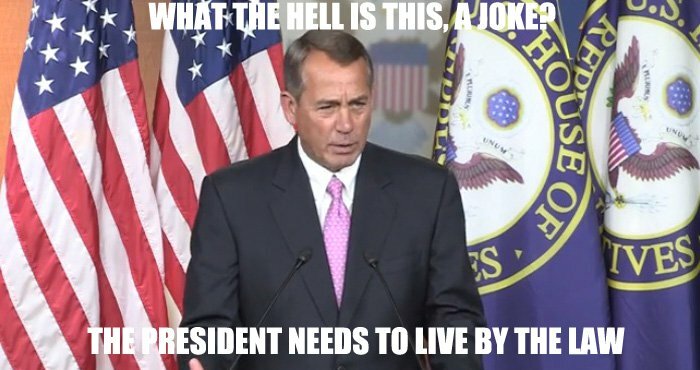 Watching Obama and the democrats damage themselves has been so amusing for House Speaker John Boehner that he has become a comedian. He sarcastically took on the Obama administration this week, for what he called their “loose interpretation” of the Affordable Care Act’s deadlines. As long as they claimed an attempt? Other than people who did genuinely try but were rebuffed by the useless system, this is an open invitation to lie, and the democrats know it, but they need to extend an olive branch to cover up for their ineptly created and ineptly handled oppressive law. ABC News asked John Boehner about his use of the word “joke” placing blame on the entire enrollment process.